Hiang Ji Roast Meat & Noodle House sits in the heart of Toa Payoh. The humble food stall offers a pleasant experience with their menu featuring a variety of delicious roasted cuisine. The first time I ordered food delivery from Hiang Ji was about two weeks ago. I ordered a mixed platter (with char siew, roast pork and roast duck) with a serving of plain rice and noodle. The delivery experience was fast. It took about less than 30 mins to deliver to my home. The food was still piping hot when it arrived. The plain noodles was surprisingly delicious with chewy noodles. The sauce has a light fragrance that heightened the taste. The meat variety was divine. The duck meat was tender with a nice herbal taste. The first thing that came to mind was that it was almost identical to the duck from Dianxiaoer. The meat was succulent and unforgettable. The roast pork on the other hand gave loud crackling sound whilst chewing. The pork skin was so crispy that it gave out the sound. Finally, the char siew was tender but was a little too sweet for me. This food quality from roast meat and noodle house is equivalent to Lian Fan Hawker Chan and dianxiaoer. Atmosphere: A typical coffee house with no air con. You can just blend with the locals easily. Food Delivery - Yocha Tea and Desserts - Desserts, anyone? With a hunger for convenience driving demand, the food delivery markets have become increasingly competitive. With the entrants like GrabFood, Foodpanda, Deliveroo, Startaster and Honestbee, consumers cheered of having food on the table without setting food out of the house. I am one of the frequent users of such food deliveries due to heavy work schedules. The food deliveries provide convenience and put food on the table when I reach home after working for long hours. For my first entry, I like to share about the dessert shop called Yocha Tea and Desserts. Located at Velocity Novena Square, Yocha is the recommended shop to have desserts. Yes, yes yes. There are many other dessert outlets that delivers to my home. Somehow, this is the best one I have ever had, compared to Blackball, and other Hong Kong desserts. Yocha Tea & Desserts offers a variety of handcrafted tea, coffee, smoothies and Asian desserts with wide selection of toppings to complement the taste experience. Consumers can opt for healthier sweetener for beverages as they claimed to use pure natural honey instead of artificial flavoured honey syrup. There are two types of dessert - Dessert Set 3 or Mix & Match your own Dessert. 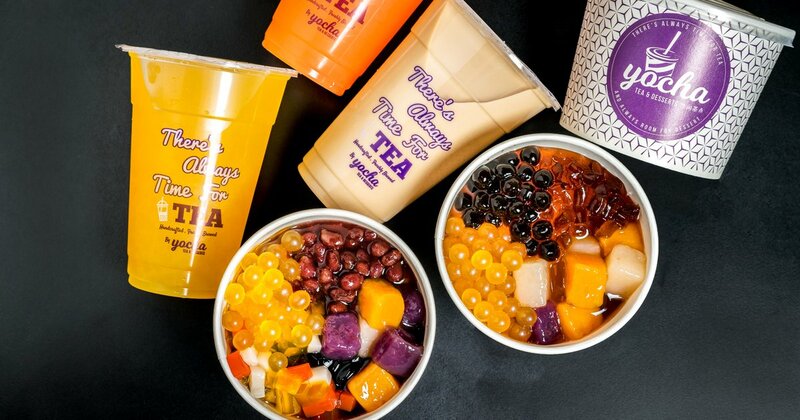 Priced at S4.20, Dessert Set 3 comprises of mixed grass jelly and honey aiyu jelly with taro Q balls, aloe vera, red beans and lychee coconut jelly. You can choose the liquid toppings for dessert and other toppings like ice cream, rainbow jelly at a cost. What I loved most about this dessert is the Taro Q balls were very chewy and flavourful. The honey aiyu jelly was equally great and chewy. As for the liquid toppings, I recommend the lemon juice. The lemon juice gave that added zest to the dulcified dessert. It made the dessert very refreshing.The black sugar milk and wintermelon juice were saccharine. As for the liquid creamer, it was too heavy to taste. Back to the types of desserts, I also customised my very own dessert and added all my favourite items, such as taro Q balls, honeyed aiyu jelly, red beans and aloe vera. With that, my total damages is about $4.80 as I added two servings of Q balls. Finally, though the desserts were great, the delivery charge of S$5.29 was more expensive than a bowl of desserts. This will be a major push factor for consumers like myself to order for this dessert too often. Beside having desserts, the Earl Grey Milk Tea was commonly nice. The delivery app allows consumers to choose the level of sweetness from 0% to 100%, and beverage toppings like pearls, grass jelly, etc. I chose 30%. The regular cup of milk tea is $3.30, more expensive than LiHO. How about smoothies? I had vanilla and cookies smoothie and it was normal. The smoothie lacked the vanilla fragrance that I did not feel the need to shout out. Priced at $5.30, I rather go for Dessert Set 3. Yocha is available for delivery via foodpanda or deliveroo. Noise Level: The noise level was reasonable as the store is located at Level 1 in the mall. T'ang Court was first awarded three Michelin stars in the 2018 Shanghai Michelin Guide. In the 2019 guide, the restaurant has dropped from three stars to two stars. Is T'ang Court worth this many stars? 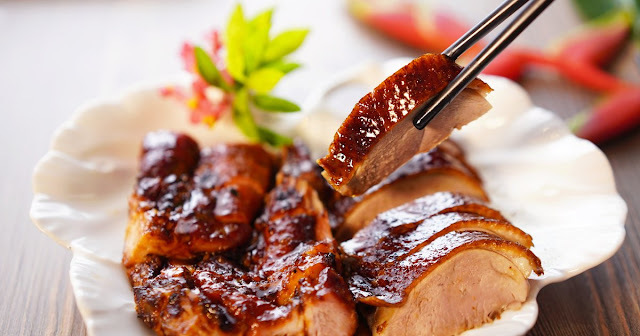 A Cantonese restaurant, T'ang Court, is housed under Langham Hotel in the famous Xintiandi. The restaurant has a elegant interior and the service was excellent. However, the food was tasted ordinary that food from household brands like Imperial Treasure or Canton Paradise tasted better. We were first served with specials from the Chef. Dumplings as starters. Ambience: It is a fine-dining restaurant but the food was seriously over-rated. At Xintiandi, you will find French Pastry chef, Christophe Adam's latest outpost for L’Éclair de Génie. L’Éclair de Génie features gourmet éclairs that come in favours like raspberry pistachios, salted caramel, yuzu meringue and pecan vanilla. I had the opportunity to try his desserts during the soft opening. The interior was simple, yet elegant. More importantly, it allows diners to relax and enjoy the delicious desserts in the cafe. While having sweet delicacies, enjoy a cup of fresh tea with lemongrass, sensha, ginger, grapefruit, orange and lemon. Each pot of tea costs RMB58. The tea was refreshing and warmed the cockles of my heart during the cold winter. Priced at RMB48, this éclair comprises of strawberry cream, red glaze and almond paste. Beautifully decoration as a strawberry, the dessert was sweet and the puff has a nice fragrance. Somehow, compared with the green tea custard puff, I love the green tea better. The strawberry did not suit my taste. Each time I visit Shanghai, I would definitely go to Yang's Dumplings for lunch. This has become a must-have when I am in Shanghai. Compared to another brand Fuchun, Yang's Dumplings is much better in many ways. The interior, similar to Din Tai Fung, is open and diners can see the chefs preparing the dumplings. At the same time, by having an open kitchen, the restaurant chain is confident of its cleanliness. Atmosphere: A very busy store and too many people in the store.